By William Mackay: WBA heavyweight champion David Haye (25-1, 23 KO’s) thinks he’s going to be different from the other 55 fighters that IBF/WBO heavyweight champion Wladimir Klitschko (55-3, 49 KO’s) has beaten during his career by keeping Wladimir from being able to jab and grab him. For some reason, Haye believes that he’ll be different from those guys and will be able to keep from getting jabbed to the head and wrapped up in a clinch. How precisely Haye will do this is the big question because he took an awful lot of jabs against John Ruiz and the other heavyweights he’s fought have been so poor that Haye has been able to beat them even with his sluggish looking lateral movement. The fact is Haye really can’t prevent Wladimir from jabbing him. Haye be able to minimize the amount of times he’s tagged with jabs if he moves all night but that will come at a cost of wearing him out because he’ll have to move constantly to keep from getting hit. Haye doesn’t fight on the inside except for when he has an opponent hurt, so that won’t be an option for him. Haye might be able to slow Wladimir down with his clinching by continuing to punch each time Wladimir attempts to clinch but that remains to be seen. Wladimir is capable of fighting without clinching, as that’s how he used to fight before Emanuel Steward was his trainer. He tends to clinch fighters that try and get inside on him. 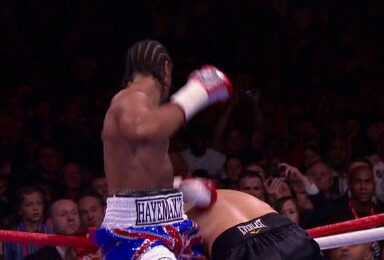 Haye isn’t someone that gets close unless he can hurt his opponent with one of his looping haymaker shots. There may not be any real opportunities for Haye to fight on the inside because he could have problems hurting Wladimir because of how far Haye’s shots will have to travel from the outside for him to land.